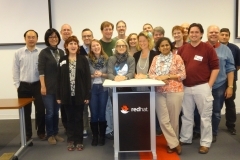 Another successful Professors’ Open Source Software Experience (POSSE) was held at Red Hat headquarters, in Raleigh, NC from November 16-18, 2016. Participants came from Eastern Michigan University, California State Long Beach, Howard University and more. In fact, the entire CS department from Berea College was in attendance! We created activities for use in our classes, collaborated on classroom approaches, and got a tour of Red Hat..
Great to see some familiar faces. Wish I could attend them all! Looks like a great POSSE session! I hope to apply for Fall 2017.